Objective: To demonstrate in a prospective cohort study that immediate implantation and provisionalization in combination with the socket-shield technique will result in volume stability of the mucosa adherent to the inserted implant. Material and methods: Patients with an indication for a single tooth implant underwent application of the socket-shield technique and immediate implantation of a provisional implant crown. A noninvasive volumetric measurement was performed according to the method described by Windisch et al (2007) at baseline and 12 weeks later. The influence of potential confounders was evaluated. Patients rated their satisfaction with the treatment, fitting accuracy of implant, intraoperative discomfort, postoperative pain, and ability to chew soft and hard foods using visual analog scales. Results: Fifteen patients with a mean age of 49.2 ± 11.9 years were enrolled in the study. All implant sites showed uneventful healing and no socket-shield exposures were observed. The soft tissue volume change assessed with the mean distance change was < 0.5 mm in all cases (-0.07 ± 0.16; range -0.37 to +0.32). A slight but significant influence of the buccal bone plate width on the soft tissue volume change was observed (b = 0.25; P = 0.037). No influence was found for apical bone height, width of gingival tissue, buccal recession or probing depths. The patients were highly satisfied with their treatment as well as with the pain and functional outcomes. Conclusions: Based on preliminary data, preservation of a buccal root segment in conjunction with immediate implant placement and provisionalization can minimize buccal contour changes after tooth extraction on a short-term basis. Tooth replacement with a dental implant in the esthetic zone is a challenging treatment modality for the clinician. Each step of the treatment from tooth extraction to the definitive restoration should be performed meticulously to achieve a good esthetic outcome. Negative effects of the extraction can be minimized by various treatment protocols. Recent developments involving partial root retention (socket-shield technique) offer enhanced buccal tissue contour in these cases. This clinical report presents a slight modification to the socket-shield technique by preparing a thin shield and performing immediate implant placement. The gap between the shield and the implant was filled with a bone graft, and a screw-retained provisional restoration supported the natural emergence profile. Through the 6-month healing period, and after 1 year of function, the natural appearance of the buccal contour was maintained. Cone beam computed tomography (CBCT) and volumetric analysis confirmed the presence of the buccal bone plate and volume stability. This case report demonstrates that improved buccal contour stability and a high esthetic outcome can be achieved with thin socket-shield preparation. The digital workflow - from the intraoral scanning, through the CAD design of the facially generated diagnostic digital wax-up, to the CAD-designed and 3D-printed silicone index with the diagnostic mock-up - provides a new approach that avoids the conventional manufacturing of casts. The development of the process requires a synchronized workflow and good communication between the dental technician, prosthodontist, and patient. This report describes a protocol for the diagnostic digital sequence for the treatment planning of an esthetic rehabilitation. Najafi-Abrandabadi, Siamak / Vahidi, Farhad / Janal, Malvin N.
Objective: The purpose of this study was to evaluate the effects of a shade-matching light (Rite-Lite-2, AdDent) and different viewing backgrounds on reliability in a test of shade tab matching. Materials and methods: Four members of the Prosthodontic faculty matched 10 shade tabs selected for a range of shades against the shade guide. All raters were tested for color blindness and were calibrated prior to the study. Matching took place under four combinations of conditions: with operatory light or the shade-matching light, and using either a pink or a blue background. Reliability was quantified with the kappa statistic, separately for agreement of value, hue, and chroma for each shade tab. Results: In general, raters showed fair to moderate levels of agreement when judging the value of the shade tabs, but could not agree on the hue and chroma of the stimuli. The pink background led to higher levels of agreement than the blue background, and the shade-matching light improved agreement when used in conjunction with the pink but not the blue background. Conclusions: Moderate levels of agreement were found in matching shade tab value. Agreement was generally better when using the pink rather than the blue background, regardless of light source. The use of the shade-matching light tended to amplify the advantage of the pink background. Aim: To compare the esthetic perception of different observer groups of 14 photos of two patients with Class II, division 1 malocclusion with severe mandibular retrusion. Materials and methods: A sample of 441 participants, of which 191 were laypeople, was obtained through a snowball sampling method. Fourteen photos of two children with Class II, division 1 malocclusion with severe mandibular retrusion were used, before and after orthodontic treatment (OT), with advance genioplasty simulation. For the evaluation of esthetic perception, the photos were rated using a numerical scale from 0 (very unesthetic) to 10 (extremely esthetic). Results: Despite a parallelism of opinions, there were statistically significant differences (P < 0.05) in the assessments made by the different observer groups. Laypeople tended to attribute higher values (statistically significant difference of P < 0.05) compared to the other observer groups, with the exception of the girl's lateral profile and smile photos before OT (P > 0.05). Although they did not agree on all the photos, the other groups expressed similar scores between them. Pretreatment photos obtained the lowest scores, and those with advance genioplasty simulation obtained the highest. Conclusions: Mandibular retrusion has a strong impact on the perception of facial attractiveness. The esthetics of the lateral profile in children with severe mandibular retrusion is improved by OT. As a rule, laypeople tend to assign higher ratings. Objective: The aim of this cross-sectional observational study was to assess undergraduate dental students' esthetic self-perception of their own smiles. Materials and methods: A questionnaire consisting of two parts was distributed to 1400 dental students at all levels of study in the city of Riyadh. The first part was intended to measure students' self-perception of and satisfaction with their own smiles. In the second part, students were asked to rate the importance of specific features of an attractive face on a 100-mm visual analog scale (VAS) bar. Results: The overall mean satisfaction index was 9.32. The participants in the intern group were the most satisfied with their smiles. The female students showed more dissatisfaction than the male students with their smiles. Among the facial features important to facial attractiveness, teeth scored the highest (86.54) on the VAS, and the rating of this feature increased in relation to academic progress. The ratings of female participants were higher than male participants for most facial features. 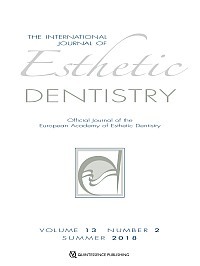 Conclusion: Although the results indicated an overall negative esthetic self-perception among the dental students, their self-reported satisfaction with their appearance increased as they progressed academically. The restoration of teeth that have been compromised by loss of crown and radicular structure due to caries, fractures, root resorption or iatrogenic lesions could result in the violation of the biologic width, with consequent gingival inflammation, loss of attachment, and alveolar bone loss. It is essential in these cases to obtain an adequate enough portion of the tooth structure to allow for a restoration that respects the biologic width. This can be achieved using a procedure that allows for the extrusion of the root in a single step, thereby shifting the compromised site from subgingival to supragingival. This allows adequate space to reestablish the biologic width while simplifying and speeding up the restorative procedures. The combination of this fast and reliable procedure with modern tooth preparation, current adhesive techniques, and the latest generation of restorative materials aligns perfectly with the philosophy of minimally invasive procedures, with undeniable advantages for patients. Dental autotransplantation is the surgical transposition of a tooth from its original site to another site to replace a lost or compromised tooth in the same individual.1 It offers a method for replacing missing teeth or avulsed and traumatized teeth, particularly in children and adolescents. This surgical therapy is often overlooked as a treatment option by dentists and oral surgeons, who typically treat space closure by placing dental implants or bridges despite the fact that recent autotransplantation studies show high survival rates and success rates of 91.3%.2 Most tooth losses due to traumatic incidents occur in young patients, and implant placement is contraindicated until the completion of growth. In cases where there is no donor dilemma, and if a suitable graft is available, autotransplantation may be the therapy of choice.